What shall I cook tonight? Quick and easy, very tasty and inexpensive – what’s not to like? A perfect January low cal supper. Gently fry the mushrooms in the oil until soft, then add the paprika and plenty of seasoning and keep frying until browned. Stir in the soy sauce. Cook the noodles following pack instructions. Meanwhile, cook the broccoli in simmering water for 3 mins, or steam it if you prefer. Put the mushrooms, broccoli and peas in a bowl with the egg. Add the noodles with some of the water still clinging to them, then drain the pan. Tip everything from the bowl back into the pan and stir to heat through. Make sure the egg is thoroughly cooked before serving, then scatter over the spring onion (and chilli and coriander if using). Hils comment: Use up any other veg you have – I fried sliced baby leeks with the mushrooms. Scatter cashews or sliced almonds on top. Do you want to know how to make crisp crunchy roasties like these? Recipe coming soon, watch this space…. By Anne Shooter and featuring recipes passed down through her family’s generations (Cherish: Food To Make For The People You Love by Anne Shooter (Headline Home, £28), this dish is based on the flavours of a fesenjan – a delicious Persian dish that’s flavoured with a pomegranate and walnut sauce . Preheat the oven to 200°C/fan 180°C/gas 6. Put the onion and aubergine in a bowl with the olive oil and toss to coat. Season with salt and pepper. Add the bulgar wheat, orange zest and half the chopped parsley. Tip the mixture into a roasting dish big enough to hold the chicken thighs in a single layer. Pour the hot stock over the aubergine and bulgar wheat mixture, then lay the chicken thighs on top, skin-side up. Scatter the walnut pieces all over and drizzle the pomegranate molasses on top. Cover the dish with foil and cook for 30 minutes, then take the foil off and cook for 30 minutes more. The chicken should be cooked through and browned, and the bulgar wheat tender. Garnish with the remaining chopped parsley and sprinkle with pomegranate seeds. Anne suggests serving with just a simple spinach salad, scattered with slivers of date and orange. I loved the crunchiness of the bulgar wheat,walnuts and pomegranates, and the taste had unusual complexity and the wow! factor. One chicken thigh was actually enough for me, as the rest of the dish was filling and so satisfying. Left-overs heated up beautifully in the microwave later in the week, served with steamed tenderstem brocolli. Try it! In a large ovenproof pan, heat the oil and add the sliced onions. Cook gently until caramelised, stirring regularly for about 12-15 minutes. Remove the onions to a plate and set aside. Add the chicken thighs to the pan, skin side down, and cook over a low-medium heat for 10 minutes, turning halfway through, until browned all over, then reserve for later with the onions. Preheat the oven to 180°C/fan 160°C/gas 4. Place the chorizo, smoked paprika and garlic slices in the pan and brown briefly. Stir in the wine, bay leaves, chopped tomatoes and red pepper. Bring to the boil then stir in the chickpeas. Return the onions to the pan, stir and arrange the browned chicken thighs on the top, skin side up. Season and cook uncovered in the oven for 50 minutes, until all is meltingly tender and the chicken is cooked through, golden and crispy. Finally, sprinkle with some chopped coriander and serve with potatoes or rice on the side. Hil’s comment: This chicken bake was easy to do and very tasty. 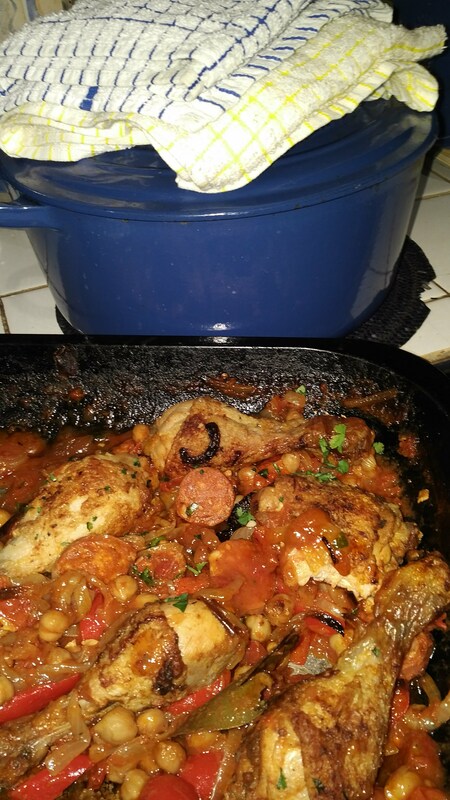 I used a mix of thighs and drumsticks, white wine, and added more than the recipe stated as I wanted it juicy. You could add halved new potatoes as well, and just serve with a green salad to make a one pot meal. Monty Don’s lovely combination of sweet, roasted squash and salty feta, mixed with peppery green rocket and toasted seeds to add some crunch. It is a very colourful dish and is substantial enough for a light lunch or supper on its own. A sweet pumpkin would also be delicious in this recipe. The seed mix can be varied depending on what you have in the cupboard. Put the cubes of squash in a roasting tin, trickle over the oil and toss to coat, then roast them for about 25 minutes, until softened and starting to caramelise slightly around the edges. While the squash is roasting, toast the seeds. Warm a heavy-bottomed frying pan over a medium heat, tip the sunflower, sesame and linseeds into the pan and cook them for a minute, moving them around constantly so they toast evenly and don’t burn. Add the poppy seeds and continue to cook, rattling the pan, for a further minute until the seeds have taken on a little colour. To make the dressing, whisk together the olive oil and balsamic vinegar. 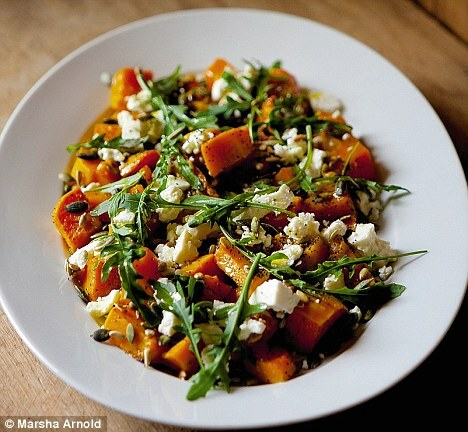 Arrange the roasted squash on a serving plate with the rocket, then sprinkle the seeds and crumble the feta over the top. Pour over the dressing and serve immediately. Hil’s comment: Tasty and healthy for a light lunch or supper. Delicious with chopped hazelnuts roasted with the seeds, and served with a sprinkle of pomegranate seeds on top. Mouthwatering restaurant style fish dish, and oh-so-easy. Heat the olive oil in a large skillet over medium-high heat. Fry the halibut steaks on all sides until nicely browned. Remove from pan, and set aside. Pour the wine into the pan, and use a spatula to scrape any browned bits from the bottom. Let the wine reduce to almost nothing, then stir in the garlic, butter and capers. Season with salt and pepper to taste. Let the sauce simmer for a minute to blend the flavors. Return the steaks to the pan, and coat them with sauce. Cook until fish flakes easily with a fork. Serve fish immediately with the sauce from the pan poured over it. 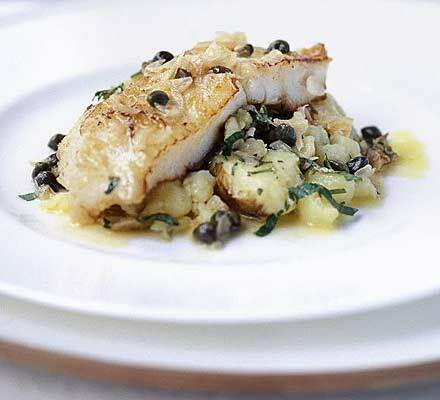 Hils Comment: Serving suggestion – lay on a bed of crushed buttery new potatoes before pouring the sauce over, and sprinkle chopped parsley over the top. Alternatively, serve with a simple rice or noodle accompaniment. Couldn’t be simpler. Halibut is quite an expensive fish, but cooked this way it makes the most of the firm flesh and delicate taste, and is more than worth the expense. Mouthwateringly delicious. Using an electric mixer, whisk together the butter, sugar and vanilla until pale and fluffy. Place the hazelnuts in a dry frying pan and lightly toast until golden. Allow to cool slightly, then roughly chop. Sift the flours over the creamed butter then fold in the marzipan, chocolate and nuts. Shape the mixture into balls and place on two baking sheets, roughly flattening them with the palm of your hand and leaving room for them to spread slightly. Bake for 15 minutes until lightly browned. Cool for a few minutes then transfer to a wire rack. Eat while still warm or cool completely and store in an airtight jar. Hils comment: Wonderful! Don’t chop the hazelnuts and marzipan too small, you want to get the crunch and taste of the nuts and marzipan chunks. Throw in a few extra hazelnuts, if you love nuts as I do, and use a good quality dark chocolate. These might just be the best chocolate chip cookies ever! Heat the oil in a medium saucepan and cook the garlic, onion and ginger together for 5 minutes until softened and golden. Stir in the curry paste and cook for a minute, then add the tomatoes and simmer for 5 minutes to make a thick sauce, stirring occasionally. Stir in the chick peas with their liquid and bring to the boil. Simmer for 10 minutes, then season and stir in the shredded spinach. Cook gently together for a couple of minutes until the spinach is just cooked. 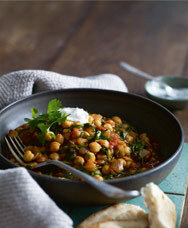 Check seasoning and serve with a spoonful of yogurt, then scatter with chopped coriander. Serve with warm naan bread. Cook’s tips: You can follow step 1, then freeze the tomato sauce for future use. Just thaw and continue as above. Hil’s comment: Truly delicious and filling, and so quick and easy. 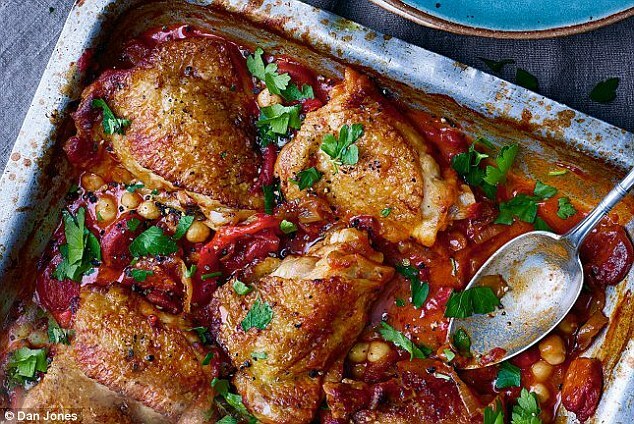 Perfect for a hearty yet healthy autumn supper. I added some cooked diced butternut squash (left over from Sunday lunch) at the same time as the spinach, which worked very well and made the curry a bit more robust. Any curry paste would be fine; I used a mix of garam masala and rogan josh. Taste it before the end and add more curry paste if necesssary. I didn’t add all the chick pea liquid as it would have been too sloppy – maybe my Waitrose Essential tinned tomatoes had a little more juice than the organic version used by Waitrose. The dish is slightly low on protein although the chick peas do contain some protein. For a totally balanced one dish meal, next time I will add a little diced tofu or sliced chorizo or sausage. Spicy warming chilli hits the spot on a cool wintery night. Easy to prepare, and even tastier the day after! Heat the oil in a large, heavy-based saucepan with a lid and fry the onion and garlic until softened. Increase the heat and add the mince, cooking quickly until browned and breaking down any chunks of meat with a wooden spoon. Pour in the red wine and boil for 2-3 minutes. While waiting, pour a glass for yourself. Stir in the tinned tomatoes, tomato purée, fresh chilli or chilli flakes, cumin, coriander, cinnamon, and Worcestershire sauce and crumble in the stock cube. Season well with salt and freshly ground black pepper. Bring to a simmer, cover with a lid and cook over a gentle heat for about 50 minutes to 1 hour, stirring occasionally until the mixture is rich and thickened. Add the kidney beans and fresh coriander. Cook for a further ten minutes, uncovered, before removing from the heat, adding any extra seasoning if necessary. Serve with rice or crusty bread, sour cream and a big green salad. 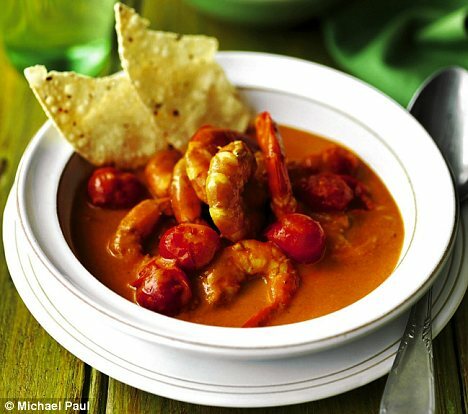 The chilli is much tastier a day or two after it’s cooked because the flavours develop and the texture becomes richer. Simply leave to cool, stick in the fridge and gently heat before serving. If you’re eating the chilli on the day you prepared it, any leftovers can be frozen in individual portions in well-sealed sandwich bags, then reheated in the microwave or by boiling from frozen in a saucepan of water for about 15-20 minutes until steaming hot. Place the curry powder, turmeric, garlic, ginger, cumin, tomato purée and sugar in a saucepan and mix with 300ml (½pt) water. Place the pan over a high heat and bring to the boil. Cover, reduce the heat and simmer for 8-10 minutes. Stir in the tamarind paste and coconut milk and bring back to the boil. Add the prawns and cherry tomatoes. Cook for 6-7 minutes or until the prawns turn pink. Serve immediately, garnished with sprigs of chopped coriander. Hils comment: Tasty and quick, and uses mainly store cupboard ingredients so a great stand by. Used a bag of frozen raw prawns , more economical than fresh with tails on! Bag of frozen mixed seafood would also work well, and be more economical than prawns.